Ever make a decision you wish you could take back? Charli and I did today. Actually, our bad decision started weeks ago when we signed up for an opportunity to help finance Roseanna's marching band fees and trip costs. We were told that one way to offset these expenses was to work as a "volunteer" at the Metrodome in one of their many concession stands. All you had to do was sell some hot dogs and nachos and every person in your group would get paid $60 toward your child's account. We did some quick math and determined that if we went down there as a family of 4 (me, Charli, Brandon and Austin) we could easily earn $240 toward this season's expenses. It would be like a family event and everyone could contribute! Even better... we'd only have to do this 4 times and we could work off the entire balance. Gee whiz... we'd be like the Cleavers - all pitching in for the greater good of the family!!! And before we knew it, our dream of working together as a caring family unit quickly fell to pieces leaving only Charli and I to fulfill the commitment we signed up for 6 weeks ago (ironically, Roseanna is too young to participate in this program). 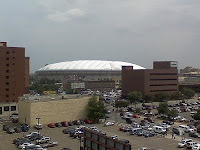 At 8:00 this morning we drove one hour to Minneapolis to work a Twins game at the Metrodome. I quickly found a "free" parking spot just a few blocks away because they don't enforce the meters on weekends. The sign that read "Meters enforced Mon-Fri only" on the sidewalk even said so. After working from 10 - 5 we finally finish the job. Let's see, $60 divided by 7 hours = $8.50/hr - each. Oh well, it's still $120 combined. But wait... suppose you walk out to your car and there's a $46 ticket on the windshield because somewhere else on that block the city had added additional yellow "override" signs that read "parking rules enforced daily" (which is apparently meant to imply weekends as well?) rather than just replace the old signs that read "Meters enforced Mon-Fri only." Ok, so now we have $120 (wages) - $46 (ticket) - $20 (gas round trip) = $54. Suddenly our combined 14 hours have now been whittled down to $3.85/hr. Oh what the hell, let's include the other 2 hours we spent driving to and fro. That makes our wages $3.37/hr! But believe it or not I actually am thankful for one thing. A few weeks ago Austin's friends parked in a restricted spot during a concert down there and came out to find their car had been towed. $275 later they had it back. So if you don't mind, I'm going to cling to that. Yikes. Glad I wasn't you today. I know that if you go to the police station and plead your case, oftentimes they will dismiss your ticket. I know because I did that when I got a ticket while I was in the store getting change for the meter, and they dismissed it. I hope that free brat was extra-delicious. Um . . . it was probably a fun, one-of-a-kind day that you shared with your lovely wife and the two of you had a great time, and, and . .. .
anon - With my luck I'd get Judge Judy. heather - So is my wife. mom - I would... if I lived in Mpls. But now I'd have to drive another 2 hours and spend another $20 to do that. No thanks, I've wasted enough of my life with that adventure. jd - The bratwurst was extra-old. I know because I'm the one who cooked it like 4 hours earlier. Yum. They got me with the second sign trick at a car show at the State Fairgrounds a few years back. Sneaky. You can never trust the parking anywhere in Hennepin County. I always just pony up the five bucks and park in a ramp about a block west of the dome. Do Dome concession stands still pull the hot dogs out of the buns and store them in a bucket of water overnight? rick - I can't help but think they make it confusing on purpose, just to trap the out-of-towners. Plus, then they know we're not going to come back into town to fight the tickets. Arggg! sornie - No, I personally witnessed them throwing 40 unsold hotdogs into the garbage. On the other hand, that was just from our 1 booth. I'm guessing they could feed thousands of homeless people with all the collective food they throw away each night. What a waste. sis - Oh but I was punished. That old bratwurst gave me terrible heartburn later on. Wait... the more I think about that saying the less sense it makes to me. No good deed goes unpunished. WTH? Now it makes no sense to me at all! In Duluth we are down to tourists, taxes, and tickets to run the city, and it is not working. Is there any chance at all that the boys had a greater appreciation for things after all this happened? You could always send them to work in a sweatshop until they make enough to pay the $46 ticket. That'd take, what, 3 years or so? Done lots of concessions but never in a venue as huge as the Metrodome. Sounds like an effing nightmare. But it made an excellent blog post! We've had great success with bagging groceries at Cub for tips. We usually make anywhere from $10-$15/youth when we do this. And Cub has free parking. How rude! Doesn't the city realize the good that you are doing? Plus if the meter wasn't clearly marked, I think you might get that bad boy reversed, after two more hours of driving and another $20 in gas, which makes you and Charli worth $3.09/hr. It keeps getting better, doesn't it? The truth is that Brandon stayed home to straighten out a computer for a customer. She was so happy that she gave him a $50. tip, and Austin went to his job selling skateboards. I have to stick up for the grandchildren! bill - Apparently you're not paying enough taxes then. ve - Thanks. And I won't go a cent below! janna - A greater appreciation?! LOL... good one! mom thumb - I'm tempted to write about how bizarre the whole event was from a process point of view. But I know I'd never reach the "excellent blog post" standard if I did. If we ever get the chance to chat IRL, I'll tell you all about it. roger - AND... I could burn a day of vacation to go to Mpls since the courthouse is only open on weekdays. It's not about the money... it's about the principle of the deal damnit! bill - Nice try dad, but they boys bowed out long before they had those commitments. But I'm giving you credit for doing your grandfatherly duty. I'm from L.A. - that's just so cute that you thought you could park for free! april - No really, I've parked there for free on weekends for years... They just changed it. REALLY! It ISN'T cute! All I can say is that my parents were much better at guilting me into doing things -- and that's how I ended up "volunteering" for band bingo for my sister's marching band. At least I didn't get a parking ticket, though. Jeff, I'm at the point now with band fundraisers where I just send a check. Last winter I spent a freezing cold precious Saturday afternoon delivering Zap-a-Snack items to their owners. Then in the Spring, I delivered the 'delicacies' to one spot, but still had to have change and deposits checks. I have more valuable things to do with my time like keeping up with my favorite bloggers! BTW, I got roped into being the official band nurse for the upcoming season! Everybody...there will be no fainting on my watch.